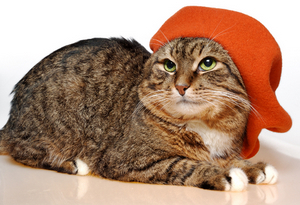 Indeed, a French cat name is just the perfect nom for your sophisticated female kitty. To help you in your search, here’s a list of female French names for your consideration. I hope this list helps you to find the right French name for your kitty. Vous parlez français? Well, even if you don’t speak a word of French, you can certainly appreciate the beauty of the French language and culture. So if you like the sound of French, check these French names for girl cats. So do you have a favorite French cat name? I’ve always liked Gabrielle and Sophie. If you are looking for a male cat name, check our page about French names for male cats, here. And for additional cat name ideas, check the links at the end of this page. If you or you cat loving friends enjoy all things French, here is a couple of gift ideas. --You can also give posters, prints and figurines featuring French kitties.